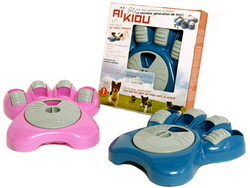 With pet obesity and weight problems on the rise, AÏkiou (IQ) Company takes in a new approach. With it's bowl already described as a new revolution in pet feeding by most of the behaviorists, Aïkiou is creating a new trend. These bowls called food activity centers not only reduce the chance of weight problems, it also helps cats and dogs to calm themselves by having a healthy food searching experience. Distributions Aikiou Inc. of Mascouche, Canada is taking a new approach to pet obesity and behavior related problems by creating the future in pet food activity centers. These dog bowls are designed for fun and as a healthy alternative to their regular dog bowl. “As we all know, dogs and cats have to find their food in nature, this activity is part of their natural behavior. With domestication, we improved the lives of those pets with our standards but forgot about their natural needs, food search being one of them.“ says creator Kathleen Desrosiers. The goal of the company is to create a full line of products designed to help pets in houses control their behavior and weight. Using these products should contribute to lower the costs associated with having a pet. It is said that overweight dogs and cats are more at risk of developing problems such as diabetes, bone problems, heart disease, liver and digestive disorders. The overweight animals will find in The Aïkiou a solution to their problem. By having to spend more time finding their food, they will learn to eat more slowly and will find satiety more quickly, what will contribute in helping them maintaining a healthy weight. This will also help reduce the costs associated with these disease in many households. With these bowls intended for regular use that work like puzzle toys as recommended by pet behaviorists and the ASPCA. Pets will have to use their nose and brain to search for their food in order to prevent boredom and excess energy, two known reason for behavior problems in dogs. It will help them find the motivation that they would usually have in nature and help solve many anxiety problems that most of today’s dogs have to face. Distributions Aïkiou is a Canadian company founded by Kathleen Desrosiers, co owner of the company. The goal of the company is to develop new products based on the interaction of the animals with their environment. Started in 2008, it released the first of a new generation of feeders with in mind the fact that animals need to use their mind as much as we do to have a life full of new experiences.